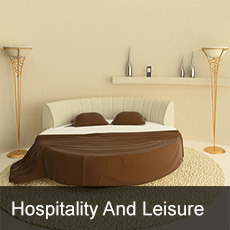 Hospitality and Leisure, IT infrastructure, Online Marketing,Inventory Management. Hospitality and leisure business has a seasonal appeal, there is highest business influx during holiday seasons or at times when the peak time to visit the location comes. In case of hotels and restaurants based in big cities, there is varying demand throughout the year from holidayers and those travelling for business purposes. The IT infrastructure of businesses in the hospitality industry must be capable of detecting these fluctuations and giving the larger picture, so that all the other activities, including procurement of raw materials can be done accordingly. We design solutions that include interactive websites with SEO enriched content and design, to gain maximum attention. Our developers will integrate functionalities and applications that can be used for spot booking of rooms with confirmation. We can also deliver online marketing strategies that will help you gain visibility on major social media platforms. Our services also include mobility device solutions, ERP solutions and business solutions that will keep the concerned persons connected with the business. Whether it is inventory management, room booking and maintenance or staff management, we will offer a comprehensive solution that will enable you to manage multiple functionalities on a single platform.